Carrion Sunflower and KnifedOutOfExistence will be returning to Althorpe Studios and Gallery in honour of the release of their split cassette; “I Find No Love In Poison, And There Is No God, I Know This Now”, on Outsider Art and IIOVV Records. 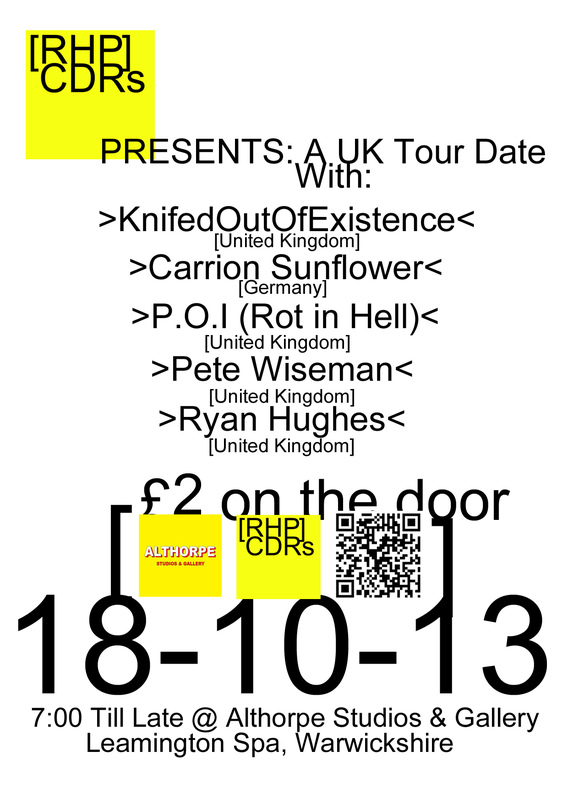 Also playing will be P.O.I (Rot In Hell). The RIH guitarist will be playing neo-folk stylings as well as there being an improvised electric guitar set from Pete Wiseman and a [RHP] CDRs DJ Set from Ryan Hughes. Pre-orders for the Carrion Sunflower and Knifedoutofexistence split can be found at www.outsiderart.bigcartel.com.